Photo: Kyle Gustafson/Swim Bike Run Photography. While runners completed the 2014 Veterans Day 10k with varying finishing times, many gave the same response post-race when they described the scenic, 6.2-mile course: fast. [button-red url=”http://www.zippyraceresults.com/search.php?ID=4486″ target=”_self” position=”left”] Results [/button-red]Pacers/New Balance runner Chris Kwiatkowski of Arlington bested all runners with a 30:11 finish, while 25-year-old Kerri Gallagher finished first among female runners, and 21st overall, with a 33:50 finish. Kwiatkowski sprinted past last year’s winner Brian Flynn’s time by 1:15. Washington, D.C. resident Paul Thistle finished behind his Pacers/New Balance teammate at 31:13, and former Georgetown University runner Rachel Schneider trailed Gallagher in 34:48. The race, largely popular because of its course, attracted more than 1,800 participants whose ages ranged from 11 to 83. Each runner’s motivation was as diverse as their age. James Finney Jr. (1:05:18) walked along Lincoln Memorial Circle shortly after crossing the finish line. Finney, an avid runner, placed first in his age group. And perhaps the morning weather was cool enough to wick away his perspiration, but he looked like he barely broke a sweat in the process. “I run around 20 to 25 races a year,” the 75-year-old Arlington resident said. “I just finished the Marine Corps Marathon on Oct. 26. I ran the Army Ten-Miler on Oct. 12 and I did the Woodrow Wilson Bridge Half Marathon on Oct. 5. Finney, a National Guard employee, said he was pleased with his early-morning performance. “I feel good about my finish. I was shooting for a 1:00:03 finish, and I finished in around 1:00:04, so I was close to my goal time. He also said he had an external motivation to run well. Not far from Finney stood Ferdinand Duyanen, who donned a black and gold U.S. Army t-shirt. The now-retired service member doesn’t consider himself to be a competitive runner, but said he enjoys the occasional competitive race. “I’m running for a good cause. I’m out here for my brothers and sisters in the service. This is my second year and it’s a great experience,” said Duyanen, who was deployed to the Persian Gulf for Operation Desert Storm, along with Germany, Japan, Hawaii and other countries throughout his 22 years in the U.S. Army. But not everyone who ran Sunday morning had ties to the Armed Forces. 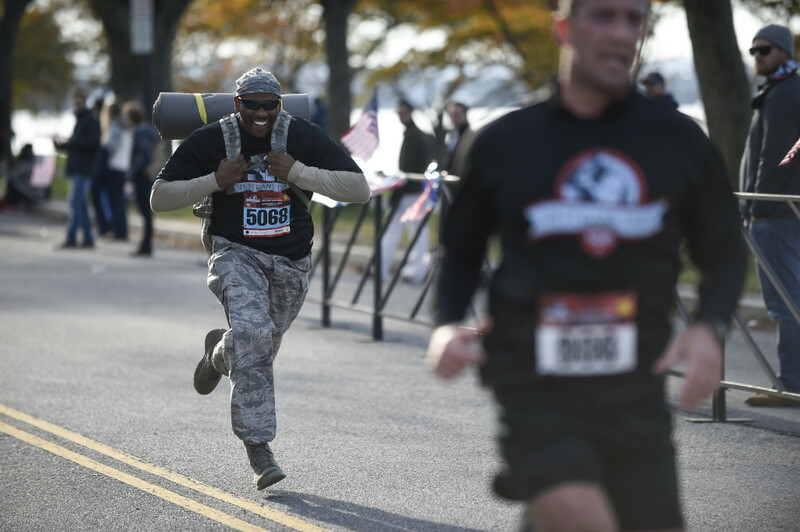 Lionel Gloster (1:08:16) first learned about the Veterans Day 10k nearly 11 years ago through a running coach affiliated with the American Stroke Association. Gloster’s mother, Mallie Marie, passed away at age 67 due to heart disease, which prompted him to begin living a healthier lifestyle. Sunday’s race marked Gloster’s sixth. And although he began his Veterans Day 10k experience under somber circumstances, it has blossomed into one that has become far more enjoyable over the years. “I really like the camaraderie between everyone – the veterans, the young and old. It’s just a great race on a Sunday morning to remember and give thanks to those who gave their lives for us. That’s what this is all about,” the 56-year-old Lanham, Md., resident said. Gloster also said the yearly races and training regimen have helped him remain free from heart disease. An ebullient Bella Drake (58:13) finished Sunday’s race with a wide smile plastered across her face. The 13-year-old Swanson Middle School student placed second in her age group. Despite her just being a middle school student, Bella said she occasionally runs with Washington-Lee High School’s cross country team. She aspires to run collegiately at the University of Oregon, like overall winner Kwiatkowski. Bella’s mother, Theresa (1:16:26), joined her for the race. As the last runners crossed the finish line just before 10 a.m., a group of nearly 30 members and mentors of the Washington, D.C.-based running group Teens Run DC crowded the area to cheer for a teammate who was finishing her first competitive, long-distance run. Leading the chorus of cheers was 17-year-old Ahmed Hassan (46:50), a senior at Woodrow Wilson High School. Hassan competed in the grueling Marine Corps Marathon just a few weeks earlier, and said he pushed his body to its physical limit to prepare and compete in the Veterans Day 10k. He finished first in his age group.